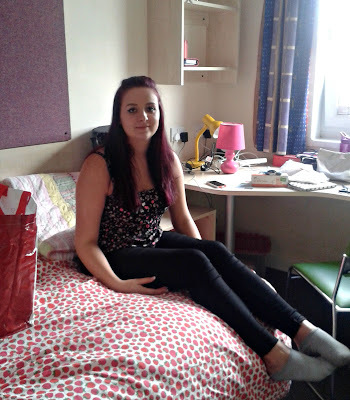 Yesterday The Teenager made the big move to start university. The build up to uni had been going on for months, and once we knew she was going to Sheffield it stepped up a notch. There were lots of things to buy, paperwork to complete, and things to organise and it went by pretty quickly. Her last week at home was spent saying goodbye to family and friends, packing and tidying her bedroom. The Teenager has a lot of stuff. To say the car was packed is a bit of an understatement. 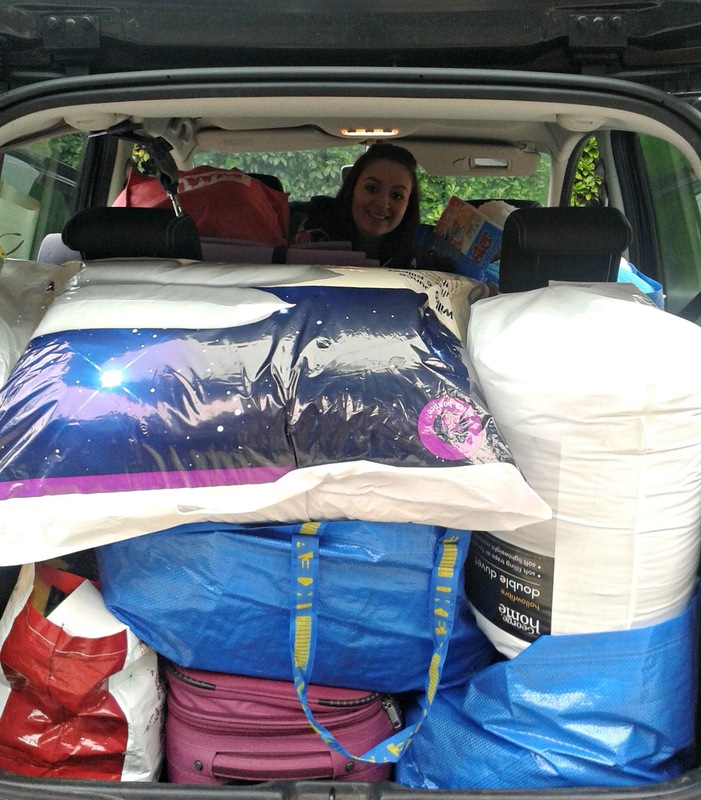 It was so full we couldn't have possibly got anything else into it, and still be able to drive safely, and now, after seeing how much stuff the other students had taken, I'm convinced she took more than anyone else. A couple of tips if you're preparing to move your teenager to uni: don't get back pain, and don't do what we did and go for a curry the night before. Either one of those things is going to make the big move a little bit trickier. Not being able to lift anything heavier than a cushion (as per my GP's instruction) and having a very delicate stomach (details spared for the squeamish) is really not helpful when you have such a busy and hectic day ahead. So, yesterday we left home just before 9am for the very scenic drive across beautiful Derbyshire and the Pennines, arriving in Sheffield just as the traffic going into the city started to get crazily busy with all the incoming students and their families. We were very lucky to find a car park space in the grounds of the student halls, and even luckier to get assistance from two absolutely lovely helpers who helped us move everything to her room. After unpacking the essentials, making the bed and having a bite to eat I realised it was time for me to go. I didn't want to be the parent who stays too long, and I knew she was keen to get chatting to her new flatmates, so I bit the bullet and made my moves to leave. Considering I'd been blubbing like a baby the day before I think I was reasonably restrained when we said goodbye. In the run up to the big day, she'd said that she didn't want me to be upset so I was trying really hard to keep a handle on my emotions. But as I walked back to the car I happened to glance up to her room and she was standing at the window waving at me. That was it, the dam burst and the tears came, great shuddering sobs of them, but at least at that point I was on my way to the car and she was spared the ugly crying face. It was the strangest feeling driving home without her, leaving her in a strange city where she doesn't know a soul, and hoping she'd be okay. It went against all of my protective mum instincts, but I suppose our job as parents is to get them safely to this stage and hope they're prepared, and ready, to take the next steps on their own. I think I've done a good job, at least I hope I've done a good job and that she's ready for this new chapter in her life. I'm sure she'll be okay, she's a very independent girl, very outgoing and she can't wait to get started. I can't wait to hear all about her new life, her new friends and how she gets on at uni. Hopefully, after all the freshers' week activities and socialising she might do a bit of studying, or is that too optimistic? Not only is it an exciting time for her, but it also means a new chapter for the rest of us. The next few weeks should be interesting as we adapt to the changes at home. Her sister is less than impressed that I've promised her my undivided attention (she took it as a threat rather than a good thing...) and I think the dog is already pining for her. Wish us luck, I think we going to need it. Have you waved a child off to university? How did it go? Any tips for coping with the next few weeks?